Customers describe why they love their Denver Divers experience. 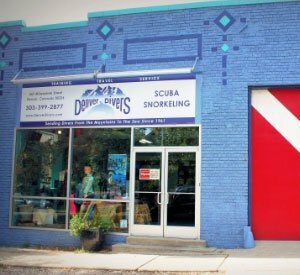 Denver Divers was founded in 1961 by one of the first pioneers in the scuba business and the store has thrived to become one of the largest in the state. Our rich history and love of the ocean has continued to inspire us to send you, our customers and "family", from the mountains to the sea through education, travel, and retail support for all things scuba, snorkeling, freediving, and swimming. In 2009, the current ownership took the helm at Denver Divers and decided to bring the love of the ocean and water to the younger generation by founding the Swim School of Denver. Built on a foundation of survival techniques and a gentle approach, the Swim School of Denver has become an integral part of Denver Divers as we work together to bring you the best experience possible in swimming, scuba, snorkeling, and freediving.